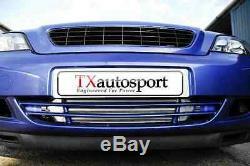 Vauxhall Zafira Astra MK4 GSI SRI Turbo Intercooler Kit + 63mm Pipework - Blue. Vauxhall Zafira Astra MK4 GSi SRi Turbo Intercooler Kit + 63mm Pipework. Large Capacity Lower Front Mounted Intercooler Kit. This Kit Has 2.5inch / 63mm Pipework ideal for high power applications 330bhp +. This Intercooler is a big improvement on the standard side mounted intercooler, it has 100% of the front core area exposed to high velocity air, whereas the standard intercooler has around 45% covered up by the front bumper. 2x Upgraded Slim Line Aircon Fans. Alloy Core Intercooler High Quality Tube / Fin Design. Complete 63mm pipework With Swaged Pipe Ends. Replacement 63mm Map Sensor Pipe. Polished Stainless Steel Shiny Pipes. 4 ply Silicone Hose's in Blue. Black and Red are also available. Super Strong Stainless Hose Clamps. Its easy to fit, comes with easy to follow instructions with photos. Only 2 holes need to be drilled to mount intercooler. GSI model bumper and Coupe needs small part inside of bumper triming inside. The item "Vauxhall Zafira Astra MK4 GSI SRI Turbo Intercooler Kit + 63mm Pipework Blue" is in sale since Monday, September 12, 2016. This item is in the category "Vehicle Parts & Accessories\Car Parts\Turbos & Superchargers\Intercoolers & Parts". The seller is "jbimotorsport" and is located in Thetford. This item can be shipped worldwide.